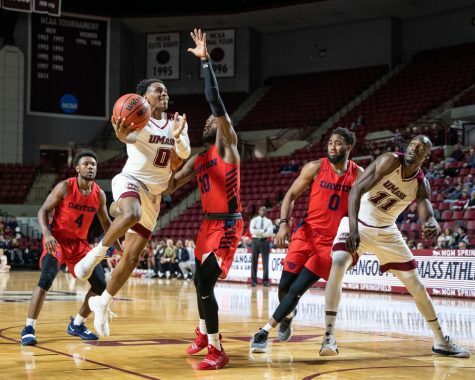 When the Massachusetts men’s basketball team ended its non-conference play Tuesday, it was evident that Trey Davis, Donte Clark and Jabarie Hinds were going to be the trio that it had to rely on as Atlantic 10 play began. 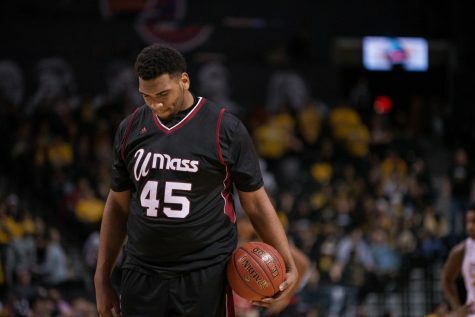 What wasn’t clear, however, was who else was going to step up for UMass (8-5, 1-0 A-10) during conference play. 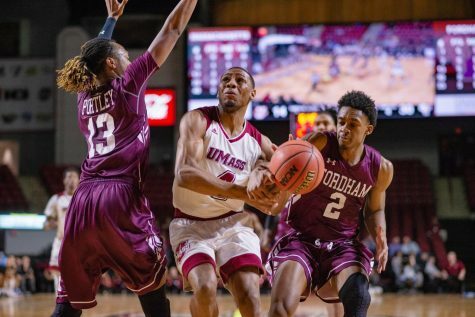 But in the Minutemen’s 74-67 win over La Salle in Sunday’s A-10 opener, it was Seth Berger and Antwan Space who stepped up and – for the meantime – established themselves as key role players for UMass coach Derek Kellogg to turn to as the schedule gets tougher. 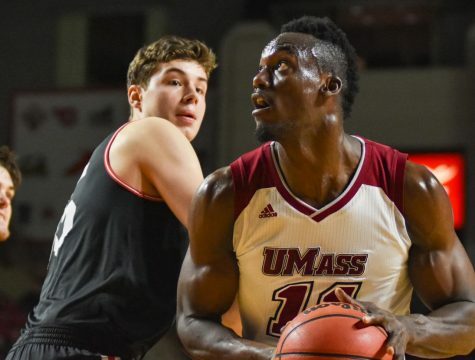 Berger, who started his second straight game in replacement of Zach Coleman (knee), finished with a career-high 15 points, seven rebounds and an assist and was the most impactful and efficient Minuteman Sunday. Space added 12 points and nine rebounds in 24 minutes off the bench. 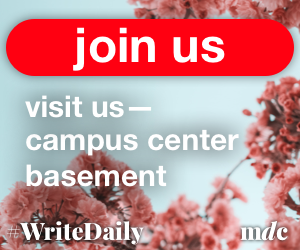 “It’s nice to get contributions from (Berger) and Space and some other guys. We are going to need to fortify our bench and get guys involved. 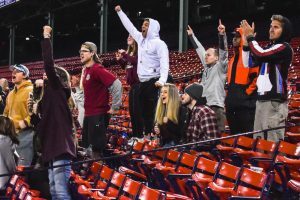 For those two to step up and do some things was great,” Kellogg said to reporters after the game. 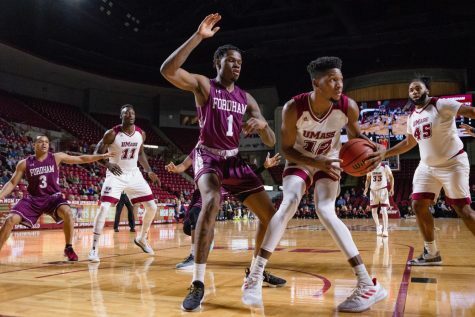 After trailing for the majority of the first half, UMass ended the half on a 12-2 run, scoring the final 10 points of the frame. Tyler Bergantino and Space each converted layups, while Davis’ 3-pointer with three seconds remaining gave the Minutemen their first lead since the 10:51 mark of the half. 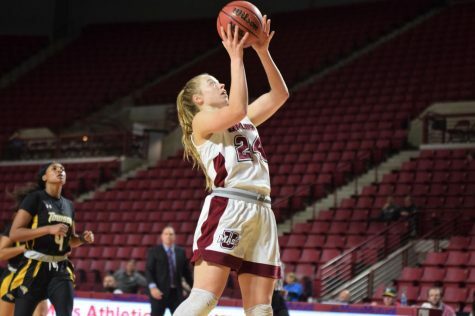 Despite not having its traditional scorers in the game at the end of the half, Kellogg credited the UMass run to its ability to move the ball around and not settle for one-on-one situations. “You look at some of the runs we are making, it’s not always with the five guys on the floor that you might think. 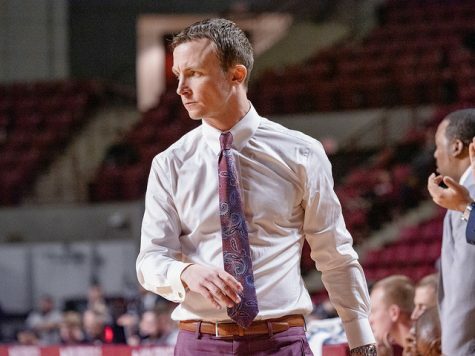 Sometimes it’s with different lineups, with not as many scorers out there,” Kellogg said. 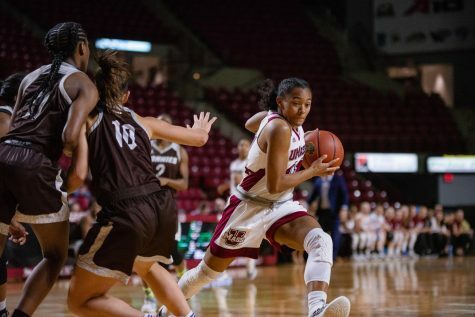 Davis, who scored a team-high 18 points, became the Minutemen’s 49th career 1,000-point scorer after making the 3-pointer to give UMass a 42-40 lead heading into halftime. “He’s gotten more confident and I think this year he’s become more of a complete scorer instead of just a guy who spots up and shoots. He’s getting to the free-throw line; he’s driving to the rim some,” Kellogg said. 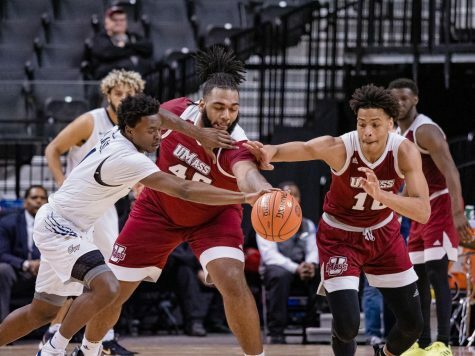 The Explorers (4-7, 0-1 A-10) scored the first five points of the second half after a Tony Washington layup and a Jordan Price 3-pointer, but their run was quickly halted after UMass countered with a quick 8-0 run of its own. Clark’s pair of free throws with 48 seconds remaining gave the Minutemen a seven-point lead. He finished with 15 despite shooting 3-for-15 from the field in addition to his five turnovers. He did, however, go 7-of-8 from the free throw line and was aggressive attacking the rim throughout the game. After scoring 80 combined points in three games against the Minutemen last season, Price finished with a game-high 23 points Sunday. Both Washington and guard Cleon Roberts added 11 points in the loss. 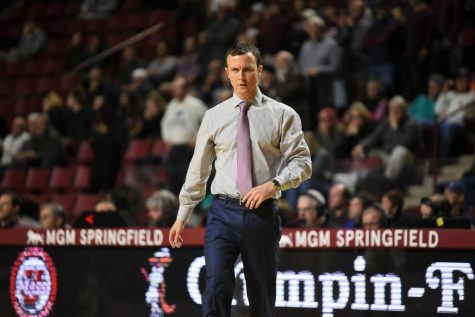 La Salle coach John Giannini went primarily with his starters for the majority of Sunday’s game with Karl Harris (12 minutes) as the only Explorer who played more than one minute off the bench. The loss marks the fifth straight for La Salle, with its last win against a Division I opponent coming Nov. 23 in a 83-75 win against Lafayette.